I first became aware of Jim's music around 2003 when I discovered a CD from his band, Incendio in a shop in the nearby fishing town of Looe, of all places. I was immediately impressed by this new, exciting and fiery direction that the Spanish guitar had taken. In 2008, unbeknown to each other, we both released solo CDs, mine called "Exotica" and Jim's called "Guitarra Exotica". I got to know Jim via the internet over the years and we both love the same styles of music. I am featuring on a track on Jim's brand new CD, "Encantado" - out August 2015. Jim is also playing on two tracks - "Moroccan Skies" and another track called "Incendio" that we worked on in late 2015, which arew on my CD, "Mandala". This was a very exciting collaboration as it was a real 50/50 split on the guitar parts, and the end result really sounds like we are jamming it out in the same room, despite being 6000 miles apart! 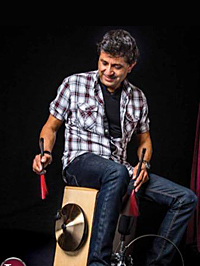 Concerts, sessions, festivals and television: Ramon Yslas is one of modern music's most accomplished percussionists. From his world tours with platinum artists including Christina Aguilera, Colbie Caillat, Patti Labelle and the Backstreet Boys, network appearances with Stevie Nicks, Martina McBride, Christina Aguilera, Carlos Santana on The Grammy Awards, The Emmys, George Lopez:Lopez Tonight Show, Saturday Night Live, Oprah, American Idol, Dancing With the Stars, The Tonight Show with Jay Leno, David Letterman and VH-1 Storytellers, Yslas is distinguished by his intuitive musicality and consummate professionalism. I am currently working with Ramon who will be playing percussion on my "Mandala" CD. 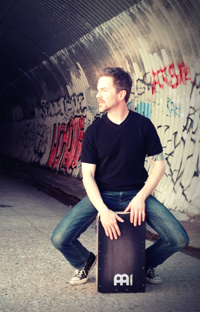 Bryan Brock is a seasoned percussionist specializing in creative applications of traditional rhythms, instruments, and techniques from all over the globe. His diverse musical background and experience results in a unique blend of creativity, versatility, and skill that enhances a profusion of musical styles. Bryan's live performance and touring credits include Frankie Valli and the Four Seasons, Anjani and Leonard Cohen, classical crossover artist Nathan Pacheco, hybrid pop artist Margo Rey, jazz songstress Melody Gardot, the Grammy Award winning Gordon Goodwin Big Phat Band, Persian American vocalist Shahrzad Sepanlou, the Estrada Brothers Latin Jazz band, the country music duo Waterloo Revival, and the world fusion of Incendio. His highly intuitive and meticulous studio sensibilities have played an integral role in numerous recording situations including sessions for Dr. Dre, India.Arie, Sara Bereilles, Macy Gray, Truth Hurts, Drew Simpson, Jim Stubblefield, and HuDost as well as jingles for Ford, Jack-in-the-Box, KIA, McDonald's, Pepsi, and 7-Up. Bryan's formal training began at an early age with classical piano instruction that opened the door to the world of percussion. He earned his bachelor's degree from the University of North Texas where he immersed himself in jazz and ethnic styles. His love of music and culture has inspired travels throughout America, Cuba, and Ghana to study with percussion masters from African, Arabic, Brazilian, Cuban, and European musical traditions. Bryan plays Meinl percussion instruments and Remo drum heads. He lives, works, and plays in Nashville, Tennessee. Bryan will be playing percussion on my "Mandala" CD. 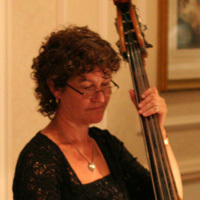 Liza Carbé is a professional bassist/guitarist/vocalist, and is a co-founder of the World Fusion band, Incendio. Liza sang in her first musical at the age of five. After moving to California from Connecticut (so that her Sicilian-born father, Nino Carbe, could return to resume work at Disney studios), she started studying guitar at the age of 9. During her first year of college, she was fortunate to have a professor who studied with cutting-edge composer and instrument creator Harry Partch. One of her first assignments was to combine her welding skills with her musical knowledge and invent an instrument. Thus the Zil was born - a three-foot metal cone with 32 piano strings. Shortly thereafter she was asked to play her new Zil on the critically acclaimed new music CD "The Pillory" and later again on the "The Pillory/The Battle" written by Jasun Martz. She also performed in local clubs singing and playing guitar and working in churches as a soloist and section leader. 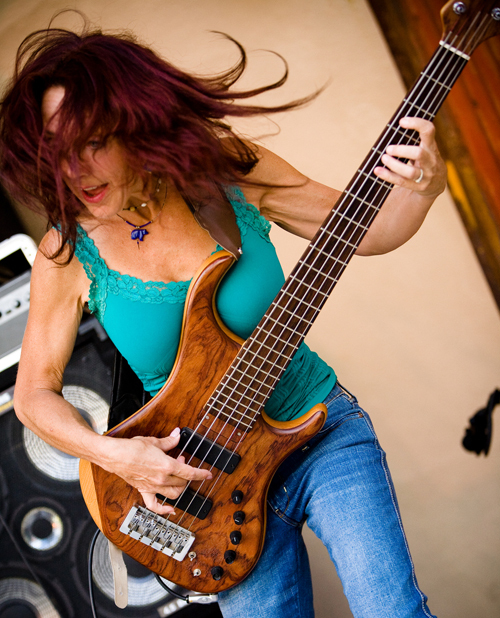 After graduating from Cal State Northridge with her degree in classical guitar and voice, she took off across the country, playing bass and singing with the 80's metal group Vixen. One year later, she took another musical left turn, touring and recording with the R&B Christian artist and one-time lead singer of Santana, Leon Patillo. As she was always writing and recording with other composers and producers, she started applying her writing talents to her band Red Van Go, wherein she joined forces with longtime friends Larry Weber on guitar and Nicole Falzone on drums and vocals. The group was an eclectic rock/jazz combo that put out an independent CD and did two tours of Japan, during which they filmed a concert on the popular Tokyo Freak television show. Through 1992-1993, she was honored to be selected to play with Lindsey Buckingham of Fleetwood Mac - she was asked to play guitar and sing on his solo tour across the United States and Canada. Amongst the highlights of this tour were getting to play "Go Your Own Way" with Lindsey every night, playing Radio City Music Hall, and opening many dates for Tina Turner as part of her "farewell" stadium tour. For the last fifteen years, she has focused on working with her husband and partner, JP Durand. In 1997, they were hired by Paramount Music to compose cues for Entertainment Tonight, which were then used extensively on many other Paramount shows. Since then, they have written many different library CD's for Sonoton, Megatrax, Five Alarm Music and Frameworx. They have also written, produced, and performed on music for "Extreme Makeover", "American Idol", "Who Wants To Be A Millionaire", "Ellen", the Flameworthy Country Music Awards, several independent films, and a host of other network shows as well as A&E ("History of Mexico" miniseries) and Animal Planet ("Who Gets the Dog" and "Ultimate Zoo", amongst others). Liza has also worked with the Los Angeles based-organization "City Hearts" which brings music, dance and art to the inner city and high risk youth. Liza has co-produced and co-composed the seven Incendio international CD releases as well as a live DVD. In addition, she has produced, co-produced, and/or engineered over 30 CD's by other artists including acclaimed international jazz vocalist Carmen Lundy, saxophonist Steve Marsh (from Lyle Lovett's Large Band), her blues project, the Red Mystics, and her pop group, Book of Storms. She has official endorsements with SWR Bass Amps, Hanewinckel Basses, Alvarez-Yairi Guitars, Audio-Technica Microphones, Mackie Designs, EAW speakers and Rotosound strings. Liza is be playing bass on the forthcoming "Mandala" CD. 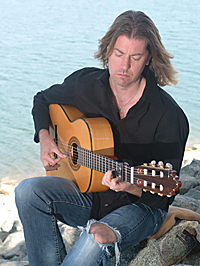 JP Durand is guitarist and co-founder of Incendio. He is by far the funniest and most intelligent member of the band. He is, however, also prone to playing with his food, and is mortally afraid of freshly-cut grass. JP's parents came from Lima, Peru, which, for those of you keeping score at home, is not in Europe. As a boy, he took piano lessons from the age of seven, learning pieces by ear and generally ignoring any disciplined approach to music. In the 6th grade, JP joined the Paulist Choristers in Westwood CA and received invaluable advanced ear training as well as experience singing the Catholic latin mass! This was followed in 7th grade by hearing Jimi Hendrix's "Purple Haze" for the first time, and it was pretty much all over. He spent the end of grade school and all of high school doing home-work and playing the guitar, getting good grades and staying out of trouble. This culminated in his parents forcing him to leave the house to stay out late and interact with other humans. After which, his grades slid and he got in trouble. At UC Berkeley, JP earned a bachelor's degree in economics while performing in a 10-piece R&B group and playing the blues at the Til Two Lounge (near Flint's BBQ in Berkeley). However, it was not until 1995 when he began to collaborate with his future wife and partner, Liza Carbe, when he really started to apply every little ideal and opinion formed by listening obsessively to all styles of music. In 1997, they were hired by Paramount Music to compose cues for Entertainment Tonight, which were then used extensively on many other Paramount shows. This is when JP discovered he could play guitar in his pajamas and be paid for it, an employment revelation from which he has yet to recover. 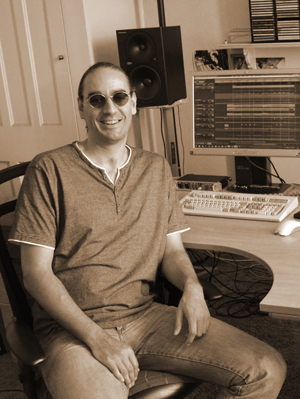 He has also worked with Liza on several different library CD's for Sonoton, Megatrax, Five Alarm Music and Frameworx. They have also written, produced, and performed on music for "Extreme Makeover", "American Idol", "Who Wants To Be A Millionaire", "Ellen", the Flameworthy Country Music Awards, several independent films, and a host of other network shows as well as A&E ("History of Mexico" miniseries) and Animal Planet ("Who Gets the Dog" and "Ultimate Zoo", amongst others). JP has co-produced and co-composed the seven Incendio international CD releases as well as a live DVD. In addition, he has produced, co-produced, and/or engineered over 30 CD's by other artists including acclaimed international jazz vocalist Carmen Lundy and saxophonist Steve Marsh (from Lyle Lovett's Large Band), amongst others. More recently, JP has returned to his roots, playing and recording with his blues group, the Red Mystics. JP has official endorsements with Alvarez-Yairi Guitars, Audio-Technica Microphones, Mackie Designs, and EAW speakers. JP has guitar solos on two tracks on "Mandala" - "Endless Rain" and "Senorita" - and also is a appearing on a few tracks as his alter-ego as a fantastic Fretless Bass player. 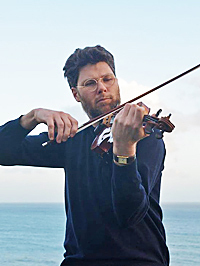 I met Jonathan at a gig in Plymouth that I was performing at, and discovered he is a top violinist who plays with a Tango band - Tango Sonoro and also the Plymouth Symphony Orchestra. 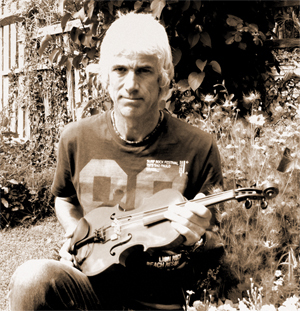 We started working together musically late 2014, and he is playing violin on 3 tracks on my forthcoming CD, "Mandala". I met Judy while recording the band "Tango Sonoro" early in 2015 - for which she plays Double Bass. I also later found out she plays flute. I've always wanted a track with Double Bass on, so Judy was perfect to play on "Potchka" - along with Jonathon on violin and me on guitar. Upon hearing her flute skills, I gave the title track, "Mandala" a new direction by adding some flute, which works brilliantly. I met Chris when living in Somerset; we used to play at the same restaurant, and ended up both playing many gigs, and on many recordings in the area by local artists, including Sarah Cunningham and Jasmin Homer. 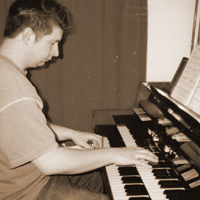 As well as playing on two tracks on "Mandala", Chris also plays piano on my CDs 'Exotica' and 'Ojos de la Tierra'. His piano playing skills are exquisite. I've know Al since 2005, when I bought one of his CDs in Plymouth. We've since then become good friends and also played together several times at gigs and parties, and have become good mentors for each other's music. Al introduced me to some great artists of the genre, including Strunz & Farah and Jesse Cook, who have since become musical inspirations to me. Al and I finally collaborated together on a recording, on the track 'Palinka' on my 'Ojos de la Tierra"' CD, where my lead lines are complemented by Al's fiery eastern solo, a style of music we are both passionate about. I met Yannaki (Guitarra Arrizza) many years ago via the internet, on the Garageband website, where you get to review other people's music (without choosing what you review or knowing who the music is by until after you've reviewed it!). We later hooked up on Facebook, and have been great friends ever since. Yannaki is half Greek, and lives in New York, so we have never met in person, yet we get on fabulously, and he has a been a great collaborator on 'Ojos de la Tierra' - our guitar styles are such a great blend, with my more traditional Spanish guitar sound, and his 'Greek-sounding' Spanish guitar that he manages to make sound half-way between a guitar and a bozouki - very cool and very unique. 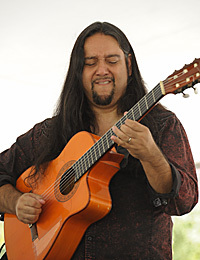 He plays a tasteful and emotive solo in 'Cielos Cubiertos' and then in 'Cafe Tierra' and 'Ojos de la Tierra' we have some great fun playing off each other's solos, creating some magical guitar-interplay in differing styles that complement each other perfectly. 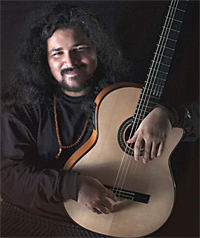 Yannaki now adds some magic to "Mandala" - with not only his Spanish guitar, but also some Turkish Saz! I met Helen while busking outside the Cathedral in Exeter in the summer of 2015. I was finishing soon and agreed to reserve my pitch for her. Just before she started her set, we had an impromptu jam togeher of a Latin number of mine, "Avocado". 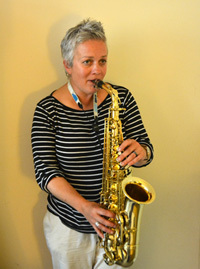 It went very well, I was impressed with her Latin/Jazz playing skills - so got her down to the studio a few weeks later to record a Sax solo on "Senorita". 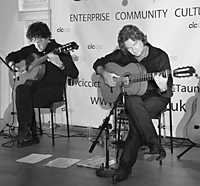 Mark's duo with fellow Spanish guitarist Jon Boyes. Following a chance meeting on an international flamenco forum in 2004, the two have been collaborating ever since, snatching the opportunity to play a handful of live performances each year in between their own busy schedules as soloists. 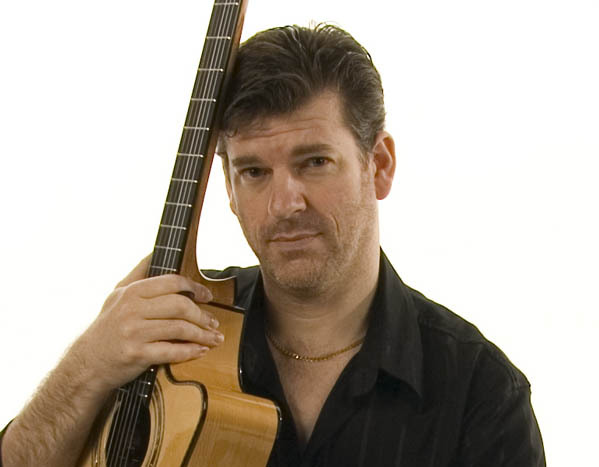 Esperanto provide a dynamic, diverse and entertaining show full of traditional, original and contemporary Spanish guitar music, influenced by Latin and Flamenco styles and at times betraying their early rock influences. I first met Seb at college in 1988. He is an extraordinarily amazing guy - not only one of the nicest people on the planet, but blessed with a phenomenal mind and aptitude to reach a high level of expertise in any given subject. Seb's two big passions are software development and music, and over the years he has managed to become involved in the areas of both of these to which he is most drawn - production being one of his big passions in the music side of things. Having kept in touch with Seb over the years and been aware of what we have both been doing, we chatted a while ago about Seb becoming involved in the production of my latest CD, 'Ojos de la Tierra'. This collaboration really has been the pinnacle of the journey involved with this CD, proving beyond all reasonable doubt that the phrase "Together we can achieve what we can never achieve alone" has never been more relevant. Having single-handedly recorded, mixed, mastered and produced all my other CDs, I decided to take a leap of faith and put the mixing and mastering in the hands of the one person on the planet I knew would approach it with an unparalleled amount of passion (rather than many companies who just view it as another job). Since taking rough mixes of the completed tracks to Seb, we have heard them evolve into something really quite special. Not only does each track have superb production, but they all have 'individuality' - something often lacking from albums in this day and age. Each song is part of a journey, and each song tells a story and evokes emotions, and Seb's input has brought these qualities to life. From the guitar sound on each track (along with a few genius suggestions he made back at the recording phase), to the arrangement and spacing of the other instruments and overall vibe, Seb just knows 'intuitively' what's needed. If you want a good job done of the production aspect of your music, there are lots of people out there. If you want an amazing job done, then look no further than Plymouth's very own George Martin. I met Tim at a party in Somerset (well I recall it was actually more of a mini-Glastonbury than your average party!) - I was playing Spanish guitar, and he was playing electric guitar in the headlining band. We got chatting about our mutual musical interests, and I subsquently played on the same CD as Tim ('Mr Incredible' by Jasmin Homer) - with Tim playing bass on some tracks and myself on electric guitar. Being impressed with Tim's bass skills, and also discovering he was a talented violinist, I recruited him as a key part of 'the Ojos de la Tierra band' for the recording of the album - with him playing bass (both electric and fretless) on eight tracks and also violin on three tracks.